Comedy! Horror! Action! Even a little bit of twisted romance! This book has it all! Who would help you during a zombie apocalypse? The Police? The Military? Your crazy prepper neighbor? No, it's time for The Zee Brothers! Two badass zombie killing brothers keeping the apocalypse at bay, one job at a time. Will they be able to stop it from happening? Can they? Grab your copy today to find out if Jonah & Judas can save the world or at least their client! In Curse of the Zombie Omelet, an Arizona sub-division is over-run by a long-buried tribe. Jump into the adventure with a race to stop the dead from unleashing an ancient curse. Tobacco chewing, Judas Zee is the gun slinging, rock music loving goofball, that is slow to learn, but always has his big brotherâ€™s back. And the hot and sassy JJ, is the heroine that captures the brotherâ€™s hearts and eyes, while doing her best to keep her dog, Xanadu, out of trouble. 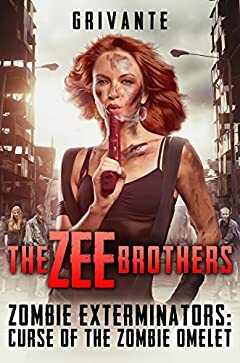 Filled with pop culture nods and heroes that just donâ€™t know when to quit, itâ€™s a slap happy, blood-filled adventure, as the trio fights off zombies and the brothers fight each other for JJâ€™s affection. If you like Ash Vs Evil Dead, Army of Darkness and Z Nation, youâ€™ll want to read this action-packed tale of zombie mayhem! Dive into The Zee Brotherâ€™s adventures today by getting your copy before time runs out!